Are you ready to go back in time? Time to cue up some Huey Lewis and the News because this vintage 4x4 is ready to take you back to the year 1986. Rebuilt to near-original specs, and outfitted with a few upgrades, this rig is ready to roll. This is the kind of truck that probably topped Marty McFly’s wish list the year after he “came back from the future.” It’s got that badass rugged look with those retro side stripes, and plenty of heavy rubber and chrome to go around. And to top it off, we outfitted this 80s dream rig with upgraded exterior lighting and gave it a fresh coat of Olive paint. Don’t be fooled by this Land Cruiser’s friendly face. The FJ62 was built in the same spirit of the original Land Cruiser — built to own any road. First, we rebuilt the original 3F engine, using OEM parts. 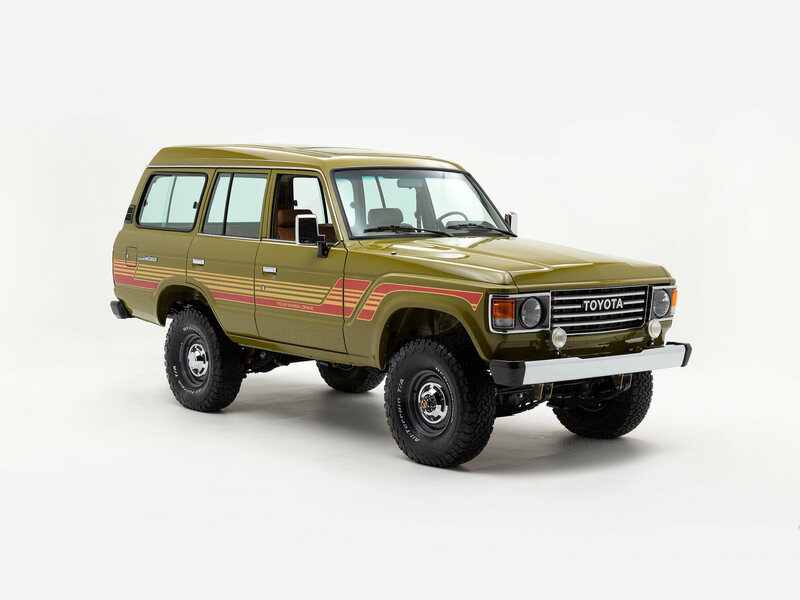 The suspension was upgraded to Old Man Emu and this FJ62's four-wheel drive components were rebuilt to mud-splashing, water forging, rock crawling perfection. So get strapped in — it’s going to be a fun ride. This Land Cruiser's cabin is comfortable and spacious with plenty of extra headroom. Seating is trimmed in durable, hand-stitched vinyl and the rear seats fold down to make way for extra cargo. Look up to take a quick glance at the altimeter and outside temperature. Then, flip the switch to open the power sunroof and let some fresh air in. Ready for some entertainment? Connect your iPhone® to the Bluetooth® -ready receiver, and let the upgraded digital sound system take your breath away. Interested in creating your own version of Toyota's first luxury SUV? Contact us, and we’ll work with you to build your dream ride. For general pricing inquiries, please read our FAQ.